Although your wedding day is probably going to be one of the most memorable days of your life, that doesn’t mean you have to spend a lot of money on having a huge wedding. When you look back on your wedding day, chances are you won’t remember every single little detail that you just “had to have” anyway, so why spend so much money on a huge wedding? The average cost of a wedding in the United States in 2014 was $31,213, excluding the honeymoon, according to a study done by TheKnot.com. “While wedding budgets continue to rise, with the national average at $31,213, guest lists are shrinking. The average wedding now has 136 guests, down from 149 in 2009,” Rebecca Dolgin, Editor in Chief of The Knot, said in a press release. In my opinion, the cost of your wedding shouldn’t be focused on “creating an amazing guest experience”, but rather on improving your own experience and spending only on what truly makes you, and your new spouse, happy. After all, they say it’s “your big day”, not your guests’ big day. If that’s not enough to convince you to forego having a huge wedding, here are 6 smart financial moves to make with your money instead. Starting your marriage off without an emergency fund is a recipe for disaster. Considering money problems are a top cause of arguments and divorce, having an emergency fund to rely on when tough times strike is definitely a good idea to help keep you and your new spouse from falling into that trap. Instead of spending $30,000 on a wedding, you could slash that in half and put the other $15,000 you would have spent on your wedding into a nice-sized emergency fund. Another great financial gift you can give to yourself and your spouse it to start your marriage off debt free, or at least with far less debt than you might have had otherwise. Again, but cutting your wedding spending down, you can put the rest of your money toward paying off your credit card debt or even your student loans. Or, if you were going into debt to afford a $30,000 wedding, you’ll sleep much better at night on your honeymoon knowing you don’t have to come home to wedding bills if you opt for a cheaper wedding instead. Once you’re married, one of the next big milestones many couples look forward to is buying a house. Although it is possible to buy a house with less than 20% down, it’s not usually the best choice to do so. If you have less than 20% equity, you’ll be stuck paying Private Mortgage Insurance as part of your monthly mortgage payment until you reach 20% equity. Plus, the more you put down on your home, the smaller your monthly payments will be. Building quick equity by putting down a large down payment will also work in your favor if the real estate market softens when you get ready to sell someday. You’ll be less likely to find out that you owe more than your home is worth. Another great option for using money instead of spending it all on a huge wedding is to invest it. We all know that investing early is best because of compound interest, but here’s a fun calculator you can use to see how much money you’d have today if you invested the cost of your wedding instead of spending it. I’ve been in your shoes, and although I didn’t spend $30,000 on my wedding (thank goodness), I do find myself regretting spending as much as I did, especially since my marriage crashed and burned. Looking back, I wish I would have spent that money on something else I needed. For example, I recently went to the dentist and found out that I may need to have to some pricey dental work done in the next year or so, to the tune of $10,000, I bet the price is worth the job because they seemed to have an awesome dental seo expert helping to manage their site. A few years ago, I could have afforded this if I hadn’t spent that money on a wedding and if I would have gone to http://rockwestdental.ca/. No one wants to think they’ll end up divorced, and I truly hope that doesn’t happen to you, but my point is that the money you spend on your wedding could likely be spent better on something you truly need. This could be something like medical or dental work, a more reliable car, or certain items for your home that you likely won’t receive as a wedding gift, like furniture and other large purchases. 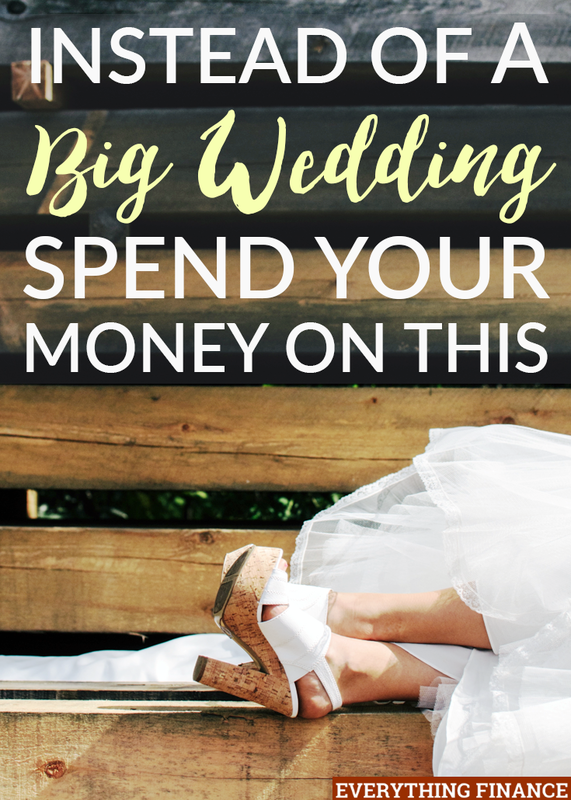 You could reduce your wedding spending and buy yourself the things you need instead. This last one is definitely the most fun item on the list. If you are into experiences instead of things, you could choose to get the most out of your wedding and your honeymoon by reducing your wedding spending and funneling the extra money into taking the trip of a lifetime. For many young couples who don’t have a lot of financial help with their wedding, by the time they pay for all of those expenses, they aren’t able to go on a real honeymoon. You can combat this problem by having a smaller, more intimate wedding so you can enjoy your honeymoon without having to worry as much about your finances. You don’t have to have a huge wedding in order to have a beautiful one that you will remember for the rest of your life. In fact, using some of that money for something other than your wedding could be the best financial decision you’ll ever make for yourself and your new spouse. Did you have a huge wedding? If not, what did you do with your money instead? If you did, do you wish you used your money elsewhere? We had a non-wedding; we just did the civil wedding and invited our friends at lunch. It was a great little event and it saved us a lot of money as well. Investing early cannot be stressed enough! The markets will go up over time and time in the markets statistically beats timing the markets over and over.